The BERKY three-wheeled ditch slope mowers are self-propelled machines that have been designed and constructed to be used in confined areas with different inclinations (ditch slopes). The space-saving construction makes it possible to drive on ditch slopes/inclinations with driving lanes starting from 60 cm and which cannot be reached or accessed by tractors or any other specialised vehicles. The stabilising wheel can be hydraulically adjusted from the driver's cab and, as a result, be adapted to the respective inclination during ongoing operation. BERKY three-wheeled ditch slope mowers can be equipped with up to 3 operating attachments and different operating equipment depending on the particular design. 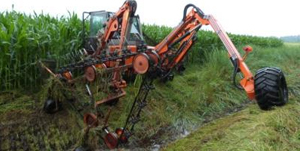 In order to clear watercourses in an ecological way, the ditch slope mowers are equipped with cutter bars in order to cut plants and with a gathering rake for raking out the ditch slope and watercourse. The three-wheeled ditch slope mower can be alternatively equipped with mulchers for effective cutting of overgrowth or with pruning shears for cutting hedges and trees. Further equipment can also be operated. BERKY three-wheeled ditch slope mowers are used for keeping ditch slopes along waters, dykes, roads, and motorways in order as well as along road beds for maintenance and care. Due to the ongoing further development, the amount of tasks which the three-wheeled ditch slope mowers can carry out is being constantly expanded, which means they offer a wide variety of uses.